Hello! Winter vacations have begun, it is very very cold in Delhi and we are off tomorrow to Pune for two weeks to be in warmer weather, meet family and friends and attend a wedding in the family. As I finish the last bit of packing on Christmas eve I wanted to post my jacket which I finished yesterday. The Sunday Brunch Jacket is an Oliver+S pattern. To tell you the truth, I bought the pattern ages ago when it first came out. Then I seemed to have forgotten about it. When I did find it about six months ago, I wasn’t feeling too keen on sewing it but then also felt terribly guilty. O+S patterns are expensive, and I have had this pattern for so long. Plus, it runs only till size 8. So I knew it was high time I used it, and luckily N was kind of in need of a jacket. 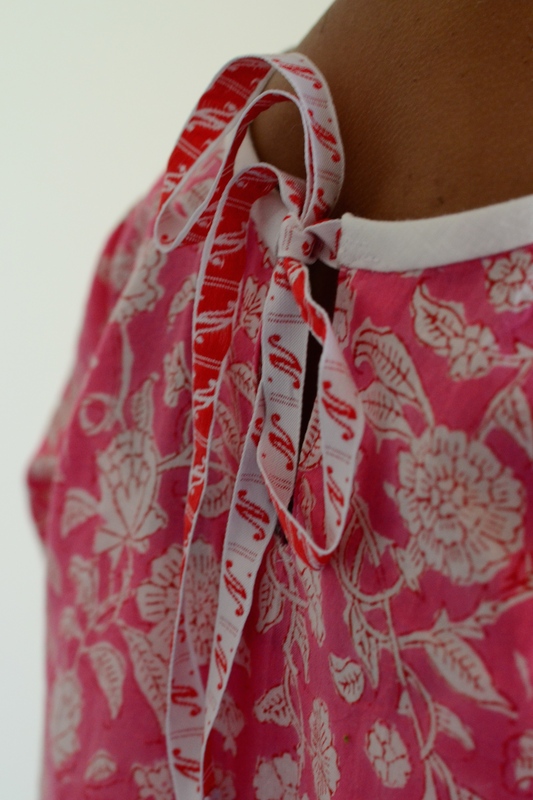 After reading several discussions on blog land regarding lining vs. non-lining and following O+S forum on sizing I decided to sew without lining in a size 6 and extended the length by 0.25″ in the bodice and 1″ in the skirt. But, as it turns out it looks huge on her! Or maybe “huge” is the wrong word. What I really mean is odd. Clearly sleeves are too long, on top of which she refuses to fold them. Its kind of loose through out but then appears to me to be too short. What I do like is the lovely flannel (also from such a long ago that I entirely forget its source) and buttons (that I got from a Japanese friend in New York). So, all in all I am not feeling super excited about. N is less ho hum about it-it is cozy and she likes the too long sleeves. And I suppose large is better than small. Finally one word of reminder to self, and a word of caution to anyone out there increasing the length in the bodice. I did not notice until it was too late that part of the armhole runs into the skirt. When you extend the bodice you don’t consider that so my bodice sewn to the skirt required a bit of shaping before the sleeve could fit into the armhole. In my case, it was only 0.25″ so it could be achieved with not much difficulty but I think I lucked out. But definitely something to keep in mind, and perhaps better only to lengthen skirt length. Alright, this is all from me for today. Have a lovely Christmas and new year. See you in 2016! 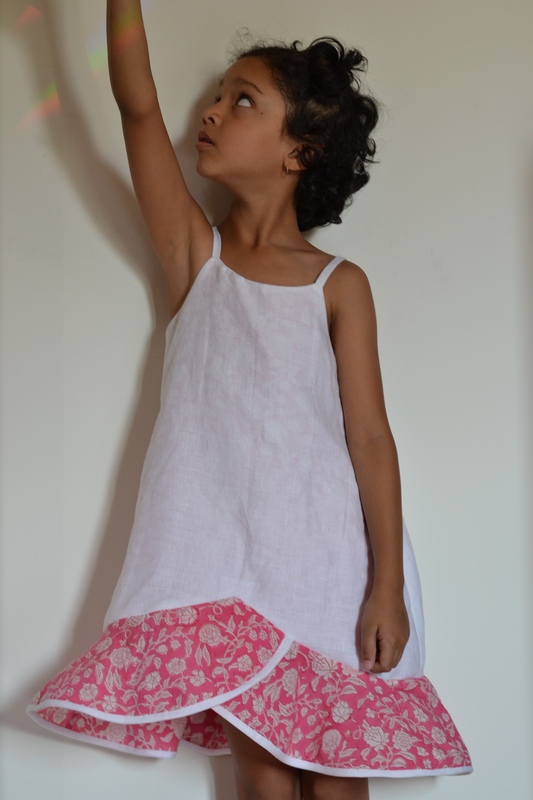 The pattern for this dress comes from one of my favourite Japanese pattern books. I have to admit that the sole reason why this dress got made right now is because I am panicking about the rate at which N is shooting up, and very soon I won’t be able to use any of my hoarded and beloved Japanese pattern books anymore. Either that, or one fine day she will not want me to sew anymore for her! Ok, at 125 cms, clearly the panic is unnecessary. And she does still want me to sew for her! But this particular book runs only till size 110cm, and N has far exceeded that. Thank fully the patterns are pretty roomy (as Japanese patterns usually are) and N is on the thinner side, so in this case I cut the pattern on the largest size and added 1.25″ to the bodice and 3″ to the skirt. It’s a simple enough frock, to me somewhat reminiscent of the kind that we wore as kids. Which is exactly what I love about it. The back has a concealed zipper (that I successfully put in–yay!!) and ties. The simplicity makes it tremendously versatile. I actually made it for Dasara (which is already almost two months ago! ), but we had no chance to do a photo shoot until recently. The girl clearly could not stand still… Meanwhile, the weather has gotten progressively colder. But I am happy to report that she has worn it quite a few times with increasing number of layers underneath, and finally I have a few decent photographs too. That seems to be the same exact facial expression as above when she wore the dress last. I am guessing this is her current “face” when I ask her to pose. Who knows? Of course, what makes the dress so special is the fabric. Of the fabric is gorgeous! It’s the first time I have used Liberty of London–purchased years ago from Purl Soho and never cut into, for the fear of making something that didn’t quite live up to my expectations. 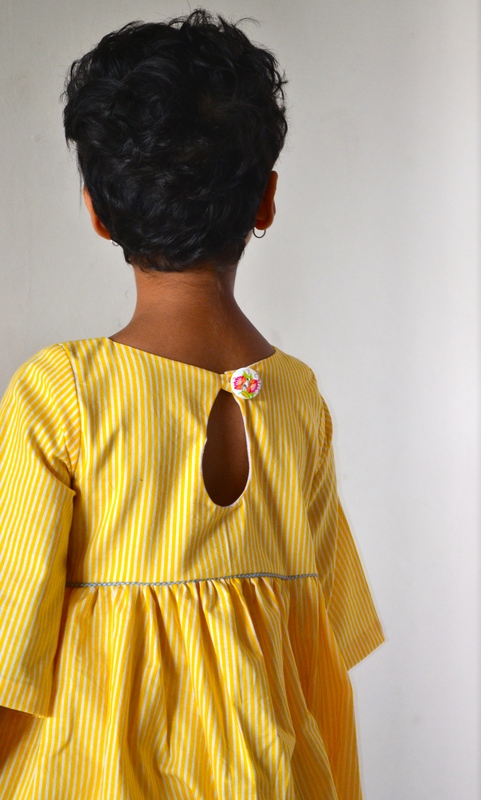 But this time she chose the fabric out of the pile in my cupboard, and I figured that Dasara was a special enough occasion for using this lovely fabric. And, the pattern simple enough for me to not mess up! So I took my time and in the end it worked out pretty well. And, it’s already making me look in heretofore un-approached directions as far as fabric is concerned. Liberty has a silky feel to it, so maybe next time I should try out silk? So, that’s all for me today. I hope you are enjoying your sewing too. I promised to come back with some more sewing and here I am. These pants, my current favourite and pretty much on the top of N’s wear-to-school pile of clothes, are Moon pants from Made by Rae. With just two pattern pieces, well three, actually four if you include the pocket and bottom band are super quick to make and high on style and fit. I made these from some red khadi cloth that I bought in Pune last summer. The bottom band and the pocket comes from the selvedge pieces. I think it all came together rather nicely. Khadi becomes softer and softer with each washing and this one is looking lovelier by the day :-). So of course given how much N liked it and the ease with which it came together, I made pant #2. The fabric for this one comes locally from H.P Singh in Nehru Place. And to make them a little different from pants #1, I added a bit of trim to the pockets. Pant #3 was soon to follow 🙂 This time in a fabric that I have been holding on to for a while. I know these don’t give much of an impression, but I love this soft grey linen, sourced again from H.P.Singh in Nehru place (Delhi). I combined versions A and B this time–so no pockets and no band at the bottom. I did however add a bit of velvet ribbon for effect. I wish I had photos of N wearing the grey pants, but all three have been in constant rotation, and in a hurry to get ready for school any photography is nearly impossible. So this last weekend I finally got some photos (with a fair bit of bribing), but alas she refused to change into the third one. So, if you are looking for some quick and stylish pants I recommend this pattern highly. This is my second time with Rae’s patterns (the first is a free pattern, which you can read about here), and the instructions live up to the many good reviews that she regularly gets. The fit is spot on-i.e they are not too wide on the thighs, a problem that I sometimes face for a thin-ish 7 year old who wears her size in terms of length but not otherwise. And finally, I have a last few photos of our photo shoot which I could not resist putting here. Yes, they are of N playing with the now almost 16 month old toddler M! 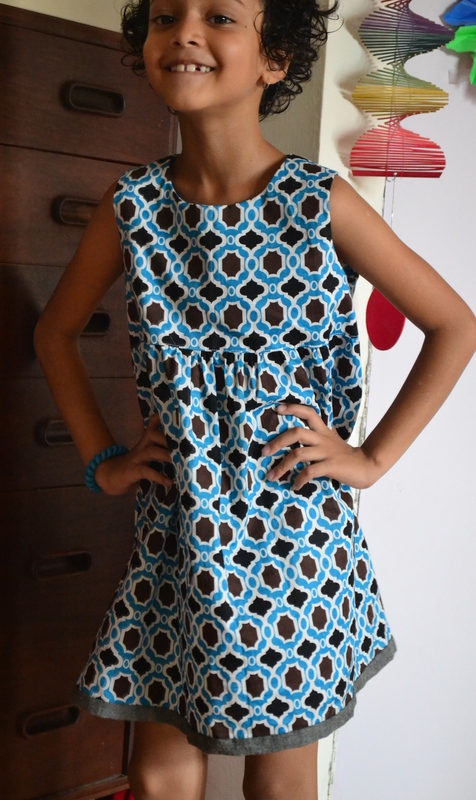 I made this dress for Diwali. Of course the way things go around here I didn’t finish it in time for the first day (thank god this year we had Diwali for four whole days) but I did finish in time for the last day. 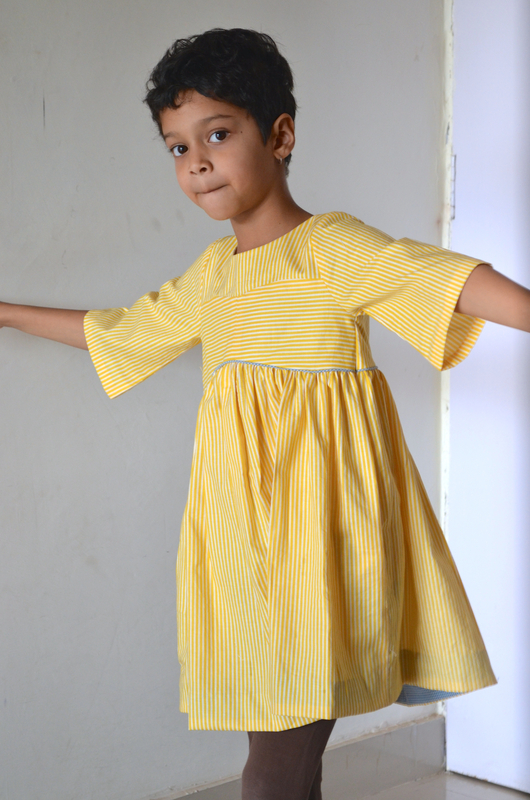 :-) That makes this little frock the official Diwali dress for 2015. 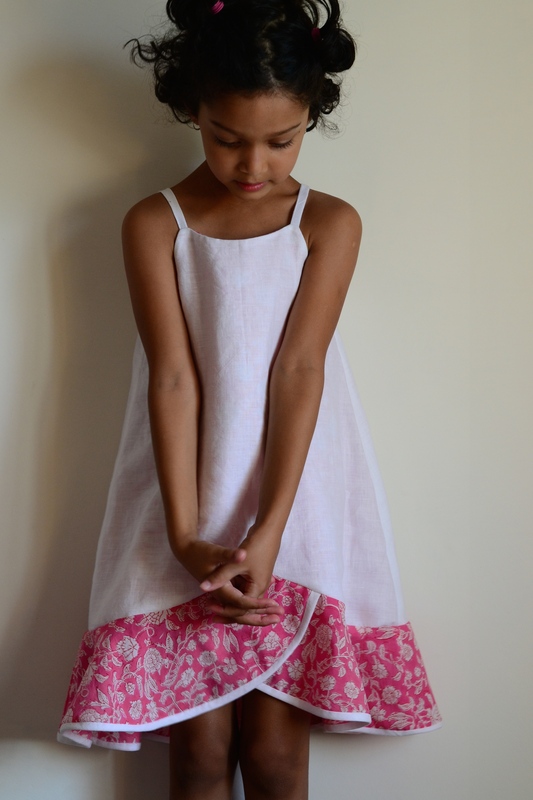 Pattern: Gardenia Dress from the Cali Faye collection. Details: I made it in size 5T with a size 6 length. Unfortunately I had cut it a about a month ago, and so by the time I actually got around to making it, it appears that Ms. N had become taller. So I needed to do a hem facing. (You can see it peeking out in the bottom in the above photo.) It still leaves the dress a bit on the shorter side, but taking another look at the photos, I notice that it does stop quite clearly above the knees. Other than the bit of hem facing, I followed the pattern instructions which were quite detailed and very clear. I made the piping too from the tutorial that came with the pattern. Again–simple and clear. I used yarn instead of cording since I didn’t have the latter and it worked out fine. The hardest part is attaching the bottom part of the front yoke to the top part (to make one whole front bodice). It needed more time more than skill, but the rest came together pretty easily. Fabric: The main fabric is a lovely yellow from Lecien (I think); the blue for piping and the hem facing are scraps from my old pajamas :-). For lining the bodice (which you can’t see) I used white voile. Thoughts on the dress: I think the most special part of the dress is the back. Look at the lovely tear shaped opening! Mine turned out so-so, but I love the idea. The button too doesn’t exactly go with the yellow blue combination but N was kind of obsessing about it and it doesn’t look too bad I think. The dress somehow feels different than the ones I have made before. I don’t know exactly what it is is, but perhaps it is the fall which was totally different than what I expected. I started out being quite excited about it, then lost interest as it began to take shape and then liking it after all, after seeing it on N for the whole day. Speaking of Cali Faye, this is my second pattern from her collection. 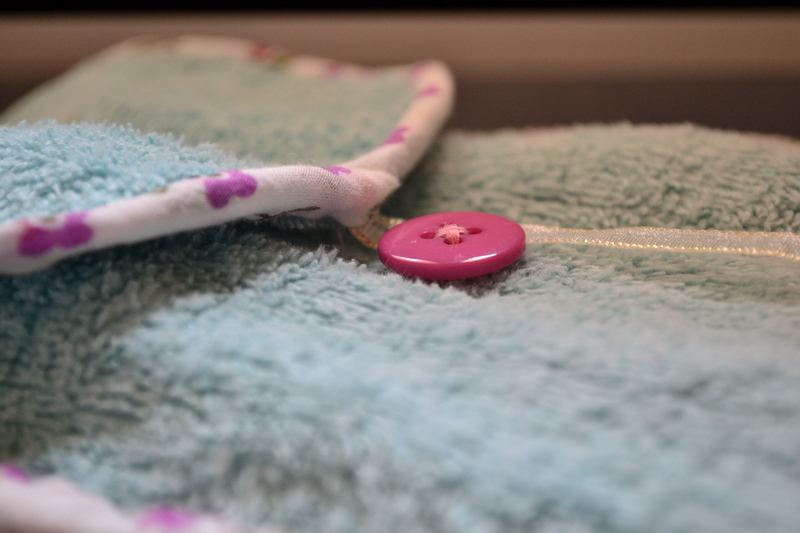 The details of the first one are here, and now that I think about it I remember not feeling too sure about it as I was sewing and then ultimately loving the result. As for N, she pretty much likes it as she still loooves her frocks very much. There is currently some vague complaint about the waist being too high or some such random thing, but clearly she did not want to take off the dress. I do hope though it gets a good bit of wear, because the rate at which she is growing taller I don’t think we have more than a few months in it! So that’s about it from me for today. I have a few other things to show from the last few weeks, but for today I’ll leave you with a few more photos…. A few weeks ago I saw Gail’s post on the mini Southport dress. Her version is lovely, the fabric choice for the pattern is as always spot on, and I was reminded that not only had I bought the pattern but also traced it out. N went away last week (on yet another trip–a school trip this time–without parents!) and with a little bit of extra time on my hand I was able to finish this. 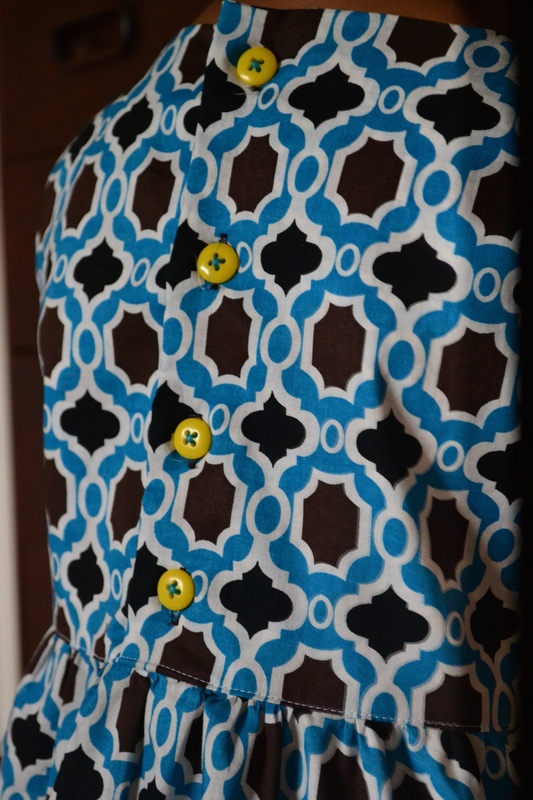 N had chosen the fabric before she left–it’s something I purchased locally a while ago. I realised that it is on the sheer side while cutting it, and almost lined the skirt but then decided not to at the last minute. A good idea I think because I love the way it looks and I wonder if that would have somehow changed the look. I cut a size 6 but increased both the bodice and skirt length to 7. It’s on the shorter side but the style goes well with the length and I think in a few days she can even wear it with a teeshirt underneath and tights below. It has been a while since I have sewed from any pattern other than Oliver+S or Japanese pattern books. I am happy to say that Kelly’s instructions for the pattern were excellent. If I may so so myself, I am pretty pleased with the neckline and armhole binding and that this is my best experience so far on attaching a single fold bias tape in these places 🙂 Also, I discovered this much later, but if you need extra help with the binding she even has a tutorial on her blog. N wore this dress through the day right after she got back and so here are a few pictures from around the house through the day. I think I may need to make a few more of these soon. It’s a really straightforward pattern, easy to make,and would look lovely in different kinds of fabric. Perhaps my next one is going to be in flannel! Have you tried out any new patterns recently that you loved? I have been unbelievably tardy as far as posting is concerned and now it is almost the end of September and four months since I posted last! Summer is almost over; it has been a long one–difficult and exhausting in parts and while I still see not much brightness in day to day life, I am relieved that the temperatures are slightly lower and that good weather will soon be upon us. Last week N, (who turned 7 a few months ago already) went on her first trip with four of her friends (and one friends’ parents.) This was not her first time without us (she has travelled before with her grandparents) but definitely the first time without any family. It meant that to a certain extent she had to look after her things, speak up for herself, and say when she is hungry or tired. The trip went beautifully well (much thanks to the brave parents who took the four kids)–no phone calls at all (!) and the kids didn’t want to come back. To mark the occasion as special I made her this: a little something to take with her. 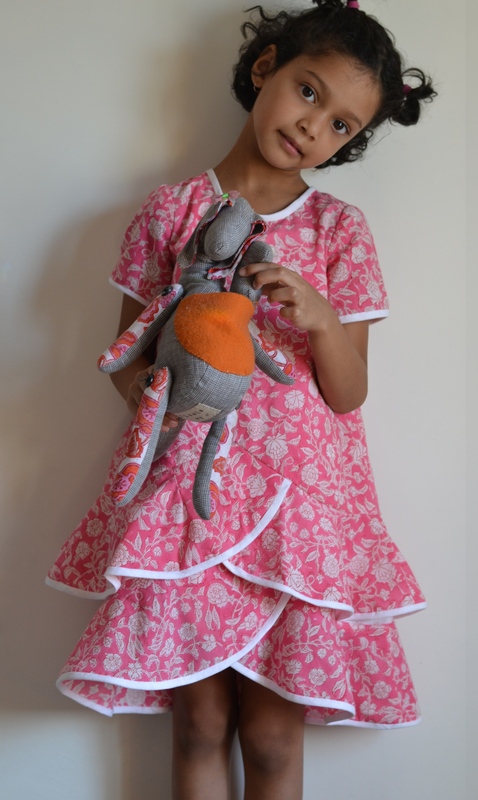 The fabric are all all scraps, and the instructions come from this lovely tutorial by Anna from Noodle-head. While she was away I also had my evenings free and so I finally finished the dress that has been languishing in the to-do pile for too long. She loved the little toothpaste case, but oh she has loved this dress! In part it is the fabric, the other part is that it is very roomy and relaxed. The days are still quite hot so she can wear it for the next month or two and its roomy enough to keep wearing it through winter. And I added yellow buttons at the back, just for fun. The fabric is from Pune where I think I bought it several years ago. The pattern is from this Japanese book (pattern B in 120 cms). The dress is on the shorter side but having used this pattern before I know the style runs slightly short. I lengthened it with a different coloured fabric. It’s still pretty short but I feel that the roomy style, so common to many Japanese patterns, makes a shorter version look better on her than something longer. Now about the book: the instructions are excellent and if you are just starting out on Japanese books this is high on my recommendation list. The patterns start at 90cms and go upto 130. This in fact was my first Japanese pattern book and while it has only about five basic patterns with a few variations the drawings are thorough and the photos lovely. Given how difficult it has been in the last few months to start and then finish anything, I am glad to have finished this one before we finished summer entirely! Thank you for stopping by. I hope to see you again soon! The last few weeks I have tried to stay away from pink but I knew that I would have to give in eventually since it’s back to heading the list of N’s favourite colour. 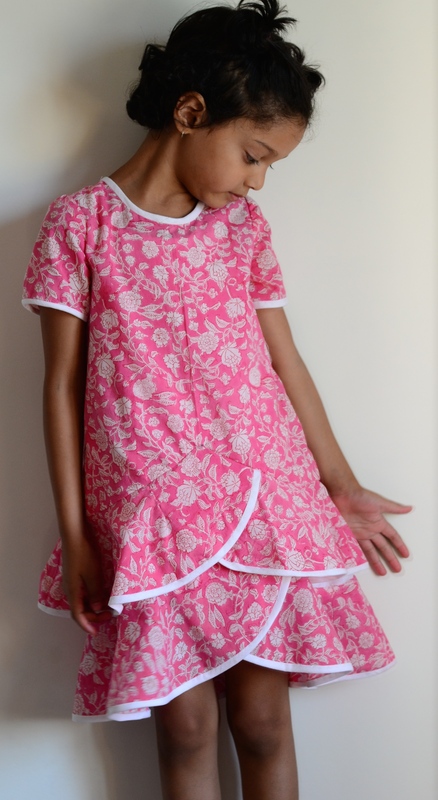 What she wanted was a pink frock with a pink frill–and luckily for me I had this pattern which pretty much fit the bill. 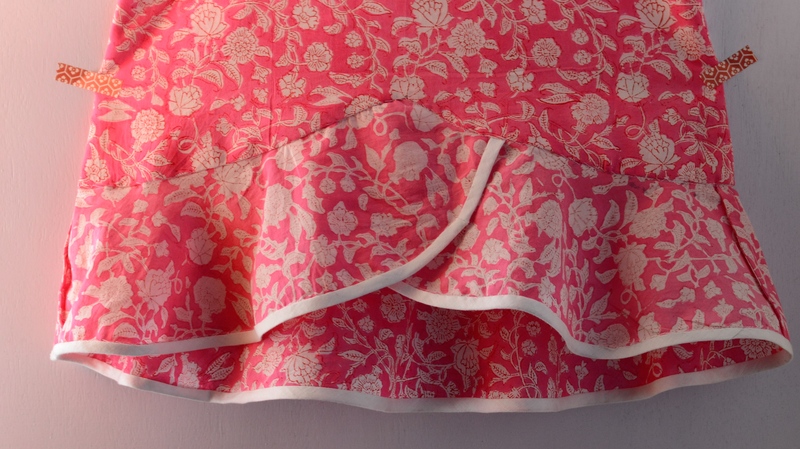 This pink fabric, quite lovely actually I must admit, is perfect for summer and I had several metres of it (brought many summers ago in Pune for making pajamas). I made the tunic out of it, and as you see in this layered version, also the flounce of the dress. For the back I added a ribbon that I had bought a long time ago while still in New York. While making the tunic (which I did first) I had a hard time with the flounce. I think I overdid the seam allowance on the flounce which made it a tad shorter than the tunic. And so in an attempt to get it to fit I was a bit overenthusiastic and ended up tearing it a bit. Do you see it on the left in the very first photo on the top? For the top part here I used linen which has also been around or long–too long I think because I forget its source. Incidentally the binding is also from the same linen and I hand stitched it entirely, since I don’t much trust my edge stitching. 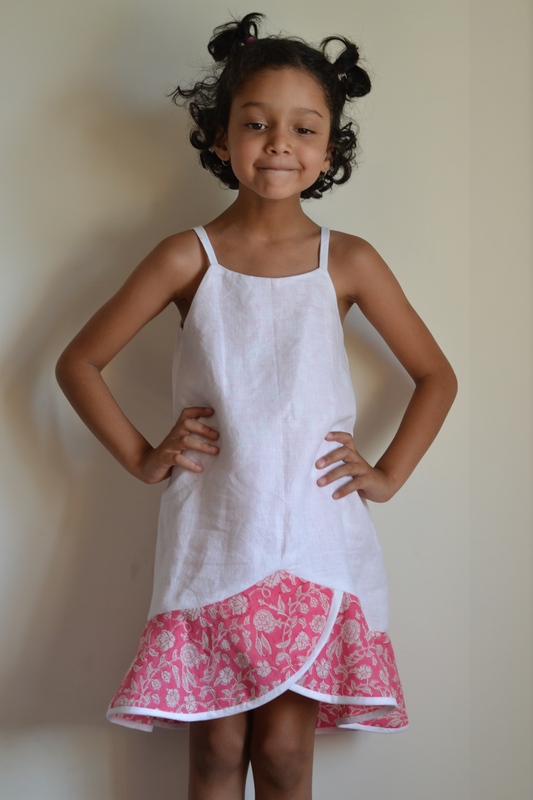 I made the dress in size 5T with 2″ added to the bodice of the tunic and the dress. It’s still pretty roomy, but sits nicely on the shoulders and looking at some flickr photos I think that is supposed to be the fit of the dress. By the second time I was a little more adapt at attaching the flounce and didn’t get any more tears. The rest of this dress (and the tunic as well) come together quickly–thanks of course to Liesl’s excellent instructions. 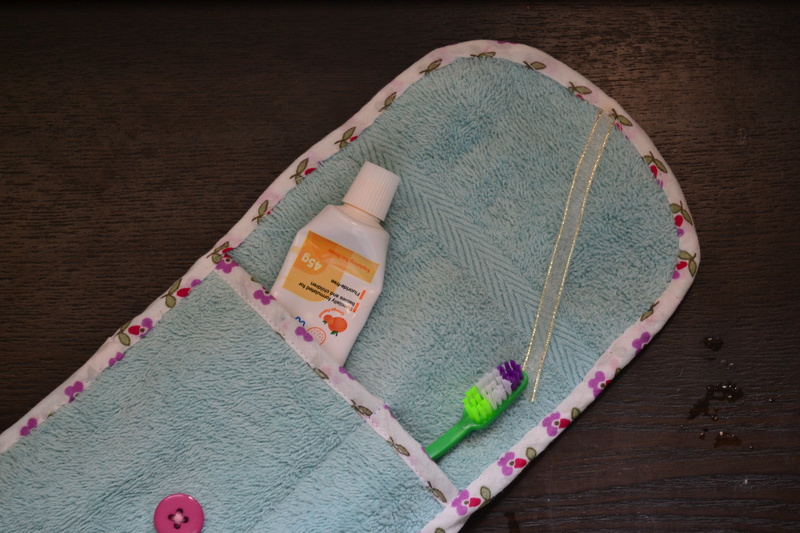 If you are new to this I would say that the flounce does take a little bit of time, although it’s not difficult. One just has to proceed carefully and with some patience especially around the front V part. All I am saying is that it’s not something to do as the last bit of sewing late at night! Since the top is linen and fairly see through I did not want to attach facing in the way the pattern suggests. With some newly gained confidence post-tear and attaching one flounce I decided to line the bodice entirely with the same pink fabric used elsewhere. Depending on the light you can barely see it, but the overall effect is quite nice and I am very glad that I decided to do it. The inside, as a result, looks something like this. Sadly it doesn’t make the dress reversible because the pink does have a front and a back but it does make for a very clean finish. Despite the tear,and not withstanding the pink-pink everywhere I enjoyed making this dress/tunic tremendously, far more than what I had thought I would. N loves it too, for obvious reasons! We leave for Pune tomorrow for a month and half long. It’s summer holidays for everyone and I am looking forward to meeting my parents, sister, friends and some nice weather!